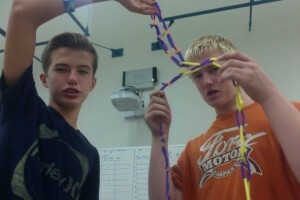 We made a chain out of paper, twine, pipe cleaners, tape, and straws. We interlocked them together to make it a chain. It went pipe cleaner rubber band until we ran out and then used the straws to work on the rest. We doubled the rubber bands to make them stronger and make it a little more sturdy. We have tested it a few times but haven’t really seen how good it holds. I think we will be able to hold all of the bottles which are all different amounts of grams.